Answer to Summons & Complaint: If you are served with a summons and complaint, this means that someone has filed a lawsuit against you. A summons notifies you that you have been sued and informs you that you must respond to the lawsuit within a certain period of time. A complaint sets forth the reason(s) and the basis for the lawsuit filed against you. You must file an answer within the specified time frame, usually 20 days, or you will lose your right to defend yourself and participate in the court proceedings. Except for a summons for eviction, you have twenty (20) days to file an Answer to Civil Summons in Florida. When Is the Last Day to File My Answer? Count twenty days starting with the day after you are served, and count every day, including Saturdays and Sundays. A summons for eviction of a rental property gives you only five (5) working days to file your answer with the court. Count five days starting with the day after you are served the summons. So for example, if the summons was served on you on a Tuesday, the first day would be Wednesday. Do not count Saturdays, Sundays, or legal holidays. In other words, if the last day lands on a Saturday, the filing deadline would be on the next business day, usually Monday unless it is a legal holiday. How Do I Answer the Summons? Read the complaint or petition to see why you are being sued and what the person wants the court to do. Then write your answer to civil summons addressing each point in the complaint. It is best to respond to each numbered paragraph of the complaint. Every allegation in a complaint is usually given a number. You should number your answer the same way. If you have other facts that you want the judge to know, add additional numbered paragraphs. Place your responses under the heading “Answer.” You may refer to the sample answer format below. After you have written your responses, be sure to fill in the other blanks such as the names of the parties and the case number. If you are attaching any copies of important documents, write the names of these documents under the heading "Attachments" at the bottom of the page (above your signature). Make sure you attach copies as your attachments. Never attach the originals. These you should keep for your own records. Finally, take a look at the last paragraph of your answer. Choose how you will give a copy to the party filing the lawsuit. This should be by either hand-delivery or by mail, then sign and date the answer. Make at least two copies of your answer to civil summons. File the original, with any attachments, with the Clerk of the Court where the complaint was filed. Look at the top of the summons to see if it was filed in the County or Circuit Civil Court. Go to this court in the county the complaint was filed, and see the court clerk to file your answer. Once your original answer is filed, the court will keep you advised of all upcoming hearings in your case. You must mail one copy of your answer to civil summons with any attachments to the plaintiff or the plaintiff’s attorney. Look at the name and address on the summons to see where to send the plaintiff’s copy. Keep one copy in a safe place for your records. What Happens if I Don't Answer in Time? If you do not file an answer or meet the deadline, the person, company, or legal entity filing the lawsuit will win a judgment against you. This is called a default. Can a Default Judgement Be Reversed? Several circumstances exist where a default can be challenged. If you were not properly notified of the lawsuit through a process called service or if you did not have a chance to respond are common grounds for challenging a default. You should seek legal advice immediately if you receive a default judgment or if you do not understand the response time frames to challenge a default. Yes. Seek advice from an attorney if you have any questions or if you need assistance in preparing your defense. Don't delay. If you miss the deadline for responding with an answer to the complaint, you may give up your rights to defend the action. I hereby certify that a copy hereof has been furnished by hand-delivery/mail to Plaintiff/ Plaintiff’s attorney this _____ day of ___________, 20__. The help you need to create an answer & file in time. 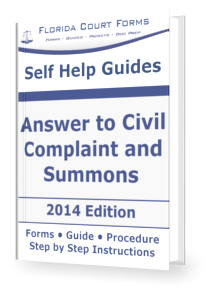 Our Self Help Guide Answer to Civil Complaint & Summons is suitable for anyone who has been served with a Civil Complaint & Summons and needs to fill out and file an answer before time runs out. Includes interactive forms, sample forms with instructions, common affirmative defenses, glossary of legal terms found in civil lawsuits, and more. The Self Help Guide includes easy to follow step by step instructions, interactive & supporting forms, filing procedures & checklists, proven forms not found anywhere else, easy to understand and written in plain English.